In the book, The Kite Runner, a story of betrayal and redemption set in troubled Afghanistan by Khaled Hosseini, the pomegranate tree is central to the two main characters' development. Pomegranate trees and fruits are so common in this part of Asia and the Middle East that it is depicted in many of its literature, paintings, and stories. It is also mentioned in several of the texts in the Torah, Bible, and Quran. 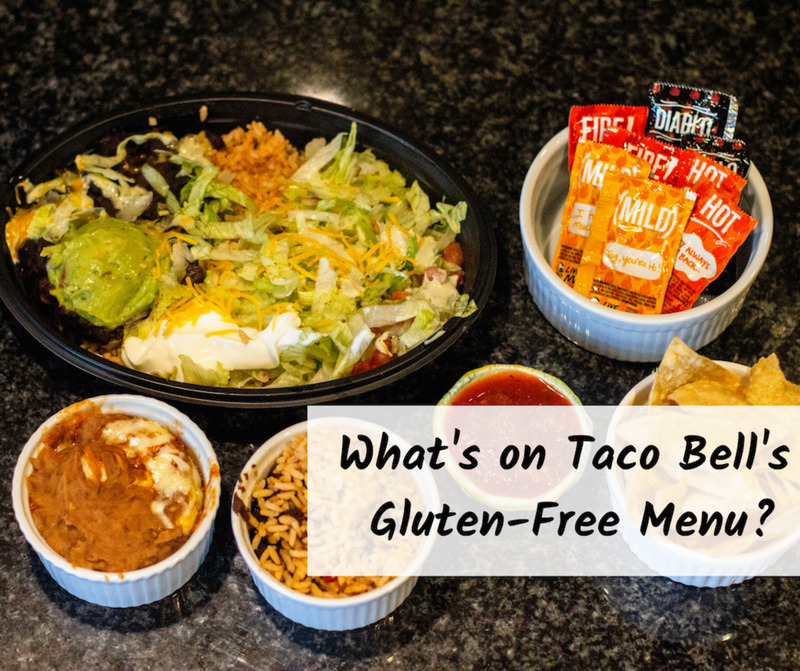 That is because it is loaded with several nutrients and will benefit those who eat them. Just like dates, pomegranate is one of the essential ingredients in most Middle Eastern food and you can find them in many of their recipes. 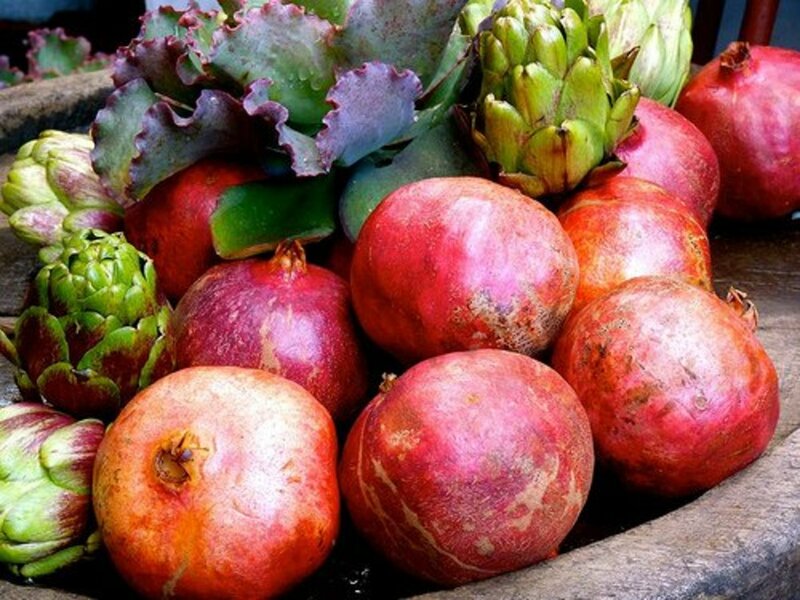 Most people will eat the fruit raw but you can also take pomegranate in the form of juice, molasses, paste, tea, vinegar and even in capsule form. Pomegranate vinegar? Yes. 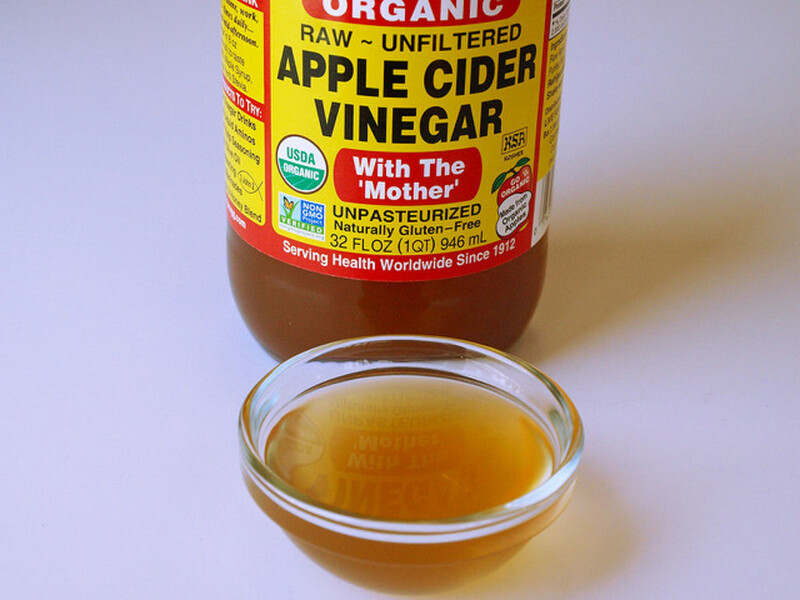 You may be familiar with the health benefits of vinegar, especially Apple Cider Vinegar. But not many are familiar with the health benefits of pomegranate vinegar. As this article is for information only, please get your doctor's advice before taking pomegranate vinegar to treat any ailments that you may have. Check if it will interfere with the medication that you are now taking. Aids Digestive System: Pomegranate vinegar is rich in acetic acid that helps the digestive system. This is done by increasing the body's capacity to take up essential nutrients from the food that we eat. To benefits from this, add pomegranate vinegar in salads or take pomegranate vinegar as a drink (mix 1-2 tablespoon in a glass of water) before or with meals. 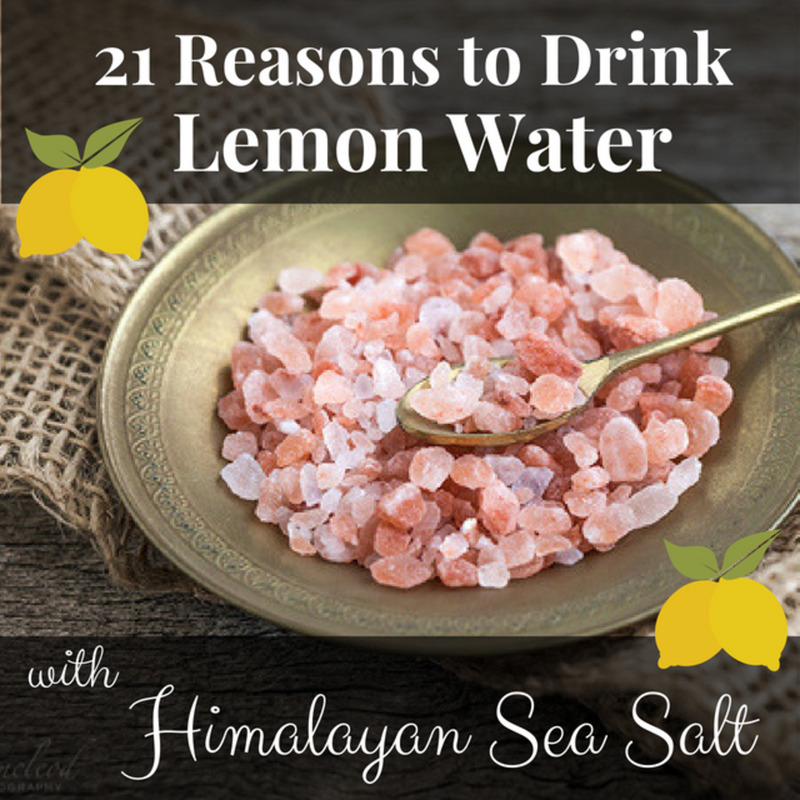 This will help improve the absorption of essential minerals found in foods. Improve Body Performance: The easy absorption of vital minerals in the food that we eat will help us fight against diabetes, cancers, and osteoporosis. Since pomegranate vinegar aids in our digestive system, it plays a part in improving our health by letting our body perform better. Better absorption of calcium: People suffering from dairy product intolerance (lactose intolerance) will need alternative sources of calcium. This can be from spinach, broccoli, or garlic. If you add a drop of pomegranate vinegar in these foods, your body will absorb calcium more easily. Lower cholesterol and blood pressure levels: Just like eating apricot seeds, Pomegranate Vinegar can lower cholesterol and blood pressure levels. This indirectly helps reduce the chances of heart diseases and strokes. Improves Memory and Mood Swings: Pomegranate fruit is rich in flavonoids, antioxidants that control free radicals and help improve memory and any mood swings such as depression. Pomegranate vinegar's rich ruby-red color is an indication of the large presence of flavonoids and hence, its benefits. Clogged arteries and HIV: It is also claimed to be a remedy for clogged arteries, hypertension, fight certain cancer cells and even beneficial to HIV patients. Pomegranate vinegar is very popular and commonly used by people from the Middle East, Turkey, Iran, and the Northern African countries such as Egypt, Libya, and Algeria. So, you will find pomegranate vinegar in the Middle Eastern/ Arab sundry shops. You can also buy it at Health Food stores and in large supermarkets that stock international foods. Alternatively, you can buy pomegranate vinegar online. As a drink: Mix 1-2 tablespoons of pomegranate vinegar into a glass of water. 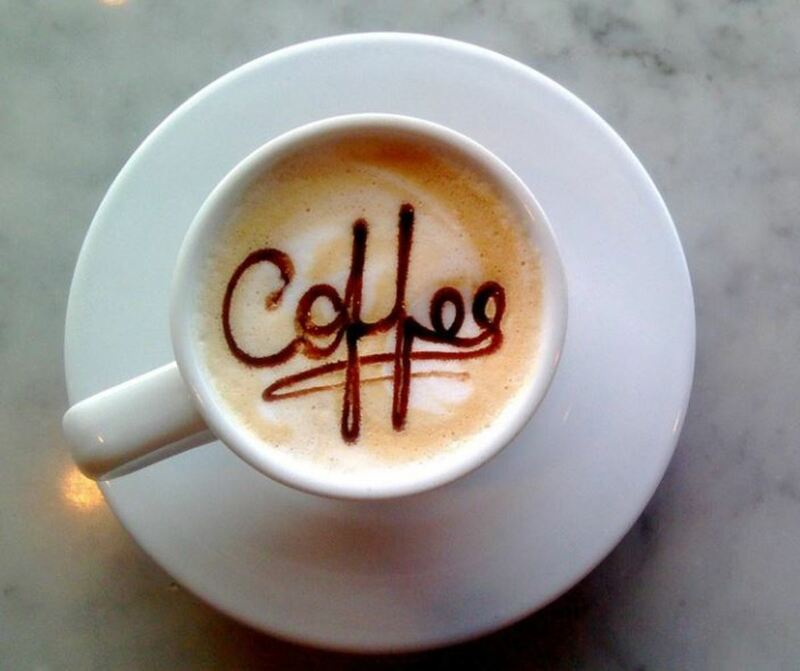 Drink first thing in the morning and last thing at night. 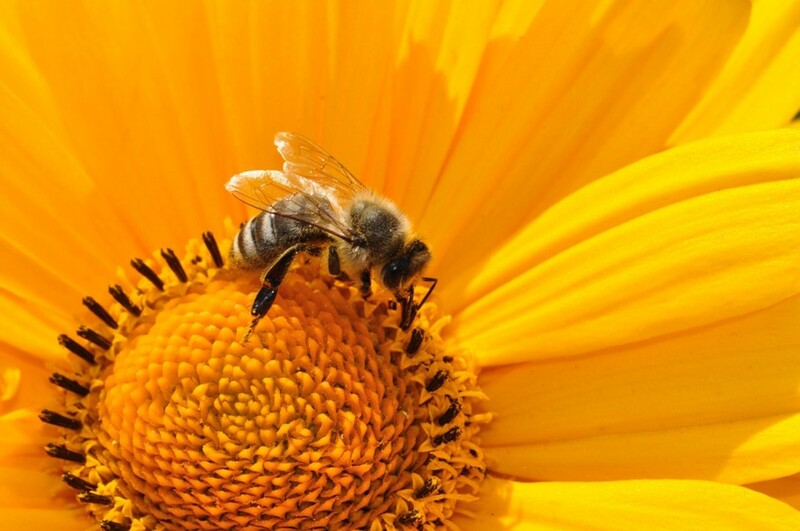 If you find it difficult to drink, add a bit of honey to sweeten the taste. You can also have it before or during meals. As salad dressing: Use pomegranate vinegar as the only ingredient in your salad dressing or experiment with a few concoctions such as mixing pomegranate vinegar with olive oil, garlic, or mustard. In your cooking: Use pomegranate vinegar to replace other vinegar in your cooking such as in barbecue sauce, soups, and salsa. It can also be used as a seasoning for fish and chicken. Marinating meat with pomegranate vinegar will give a fruitier flavor to your cooking. In your pickle: If you pickle vegetables such as garlic, cucumber, and gherkins, use pomegranate vinegar instead of your usual vinegar. As a dip: Add pomegranate vinegar to olive oil and use it as a dip. With the growing popularity of pomegranate vinegar, some companies are now selling their version of pomegranate balsamic vinegar. Marketed mainly as salad dressing, you can also use it to glaze meat such as lamb and even duck. If you are adventurous, use it for grilling and stuffing. With its sweet, sour and tangy flavor, pomegranate balsamic vinegar combines well with garlic olive oil, lemon olive oil or basil olive oil. 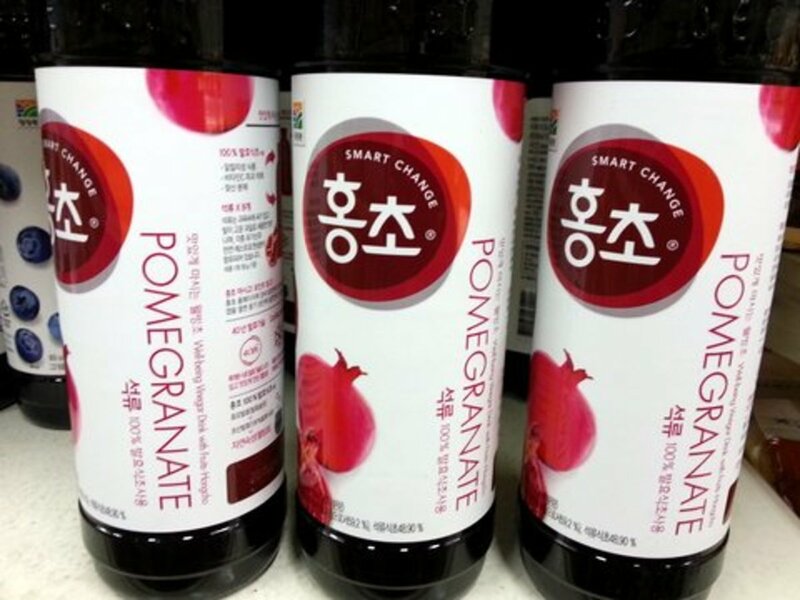 Lately, Koreans have been actively marketing the virtues of vinegar drinks and used celebrities to market their respective brands. There are several Korean brands that specialize in fruit vinegar. Among the most popular are pomegranate vinegar, persimmon vinegar, and raspberry vinegar. You can find them at most of the Korean grocery stores. Another way to enjoy these fruit vinegar is to freeze them as ice cubes and add it to drinks, yogurt or as a popsicle. Beat together the pomegranate vinegar, molasses, honey, mustard, salt and pepper. Then slowly add in the olive oil until completely blended. Whisk together all the ingredients until emulsified. Before you decide to brew pomegranate vinegar yourself, let me caution you that the process is very sensitive and tends to spoil easily. For example, if part of the crushed seeds were to enter the juice, the fermentation would be spoiled. As a rough guide, you will need four kg (8.8 lb.) of pomegranate fruits to produce one liter (0.26 gallons) of pomegranate vinegar (after evaporation and filtration losses). After peeling the fruits, juice them and placed the liquid in a juice jar. Refrigerate for two days. This will allow all the crushed seeds to settle to the bottom. Filter the juice carefully, making sure the crushed seed does not enter the filtered part of the juice. Don't throw away these crushed seeds as they can be eaten and are a good source of fiber. After placing the filtered juice in a new juice jar, cover the jar with a cloth and fasten it properly with a rubber band. Store the jar in a dark room and allow the juice to ferment for 30 days. Next, filter it a second time and ferment the twice-filtered juice for another 60 days. At the end of this 90-day fermentation process, filter the vinegar one last time. Keep the filtered vinegar bottled, and store it in the refrigerator. It will be sharper and crisper during the next few days. Then, you can start using it. Studies by Wang L and Martins-Green M on Pomegranate and its components as an alternative treatment for prostate cancer. Studies by A Robert Neurath, Nathan Strick, Yun-Yao Li, and Asim K Debnath on pomegranate juice as an HIV-1 inhibitor. 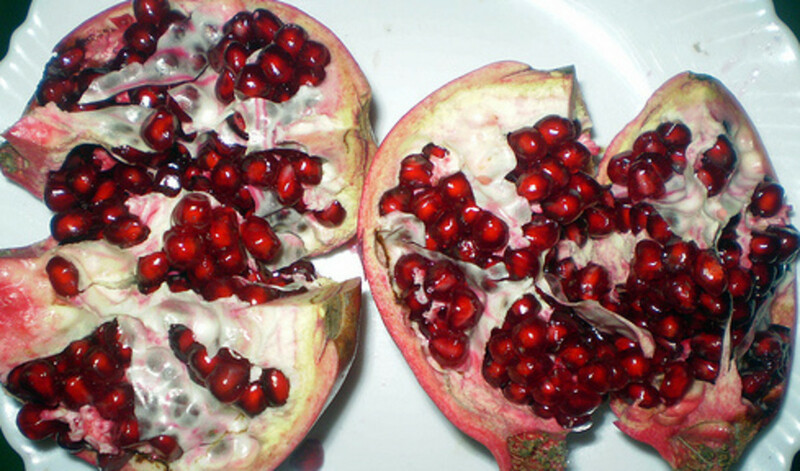 Studies by Adhami VM and Khan N, Mukhtar H. on Cancer chemoprevention by pomegranate - laboratory and clinical evidence. Elsevier's Scopus, the largest abstract and citation database of peer-reviewed literature. Search and access research from the science, technology, medicine, social sciences and arts and humanities fields. is pomegranate vinegar safe for pregnant women? Can a diabetic person use pomegranate vinegar? The sugar content in pomegranate vinegar is not that high, but to be on the safe side, I suggest you ask your doctor. Hi Tina. I honestly can't tell you if there will any adverse effect if you take pomegranate-apple cider vinegar and menomood herbal tablets. But what I do know is that menomood has St. John's Wort and Black Cohosh. One of the side effect of St. John's Wort is constipation and the feeling of fullness in your stomach. Black Cohosh's side effect is also constipation. Both of these may be the cause of your constipation. I suggest you stop taking menomood and seek doctor's help for your menopause problems. Hi, Mario. That sounds great. You can earn some extra cash if you sell your pomegranate vinegar online, such as through amazon.com! Give it a try. I make Pomegranate Vinegar since 2009. I have a 5 gallon from this year's fruits from our trees. I am quite certain of this "reverse quantity" effect. 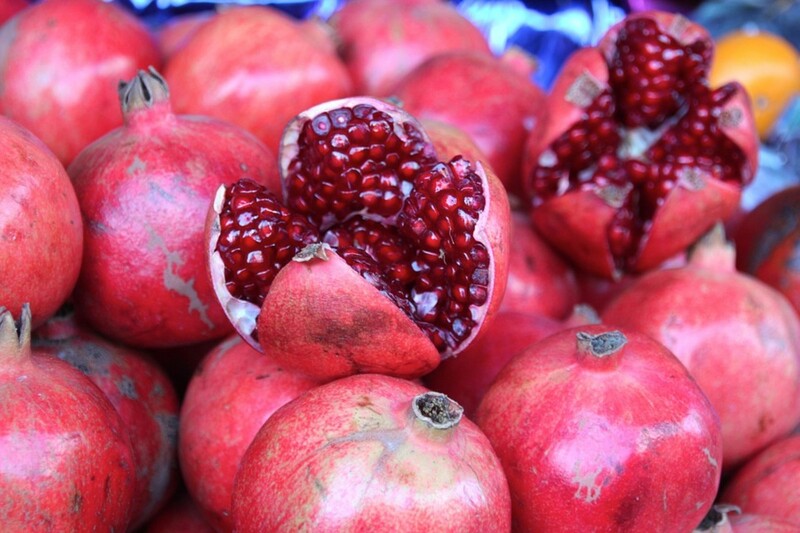 It appears that there are still unknown facts about the content of pomegranate. It may be that some of the active ingredients are behaving in this way. The amazing local Korean Deli here has a "black label" bottle of pom vinegar mixed with rice vinegar. The owners say the rice vinegar is more powerful than even pom vinegar (they also recommend small quantities mixed with water). I use pom vinegar every day. I've found it is more potent if you use only a small amount mixed with water. Large amounts are less effective! Why this is I do not know. I have gastric and I take dates vinegar, pomegranate vinegar and sometimes apple cider vinegar, and I have no problem. If the person has a hyper acidity can still drink pomigranate vinegar? Pom Vinegar does lower your blood pressure and help reduce clogged arteries. Hence, blood can flow better to places that it has not reached before. As you had discovered it does wonders to your life, which we will not elaborate here. Enjoy your kaboom! I am 60 and have been having a relationship with a 30 year old woman for five years thanks to pom juice. The pom vinegar is more than twice as powerful as quality juice!! kaboom!! We have a saying here "bigger than ben hur". 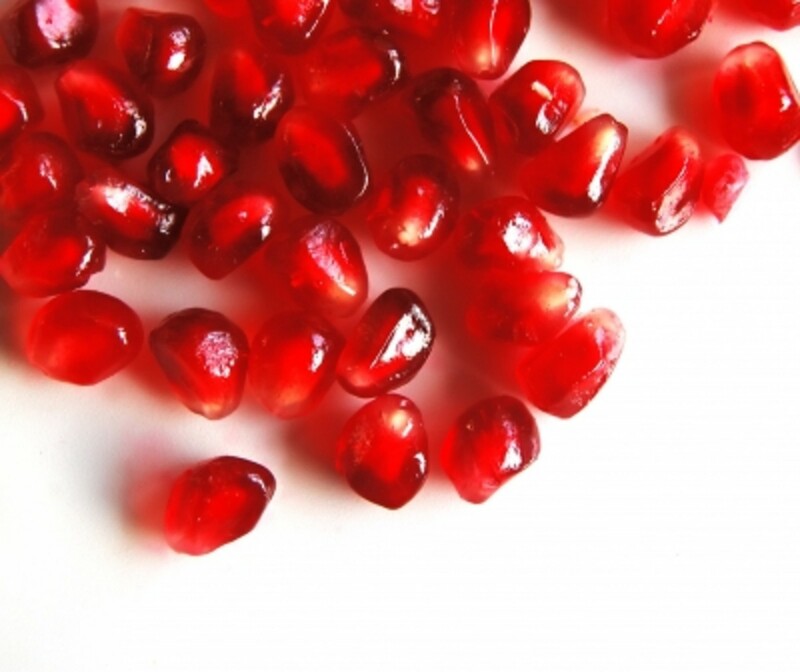 Pom is one of the few aphrodisiacs for people with high blood pressure. The other main aphrodisiacs are for people with low blood pressure. I am just now finding out that the pom vinegar seems to be drastically lowering my blood pressure. I will be testing this over the next few weeks and getting back to you. Oztinato, glad to get to know a lover of vinegar and esp. pomegranate vinegar. I too love this stuff, but lately had been taking the Dates Vinegar instead as it is cheaper! Keep us posted on your romance with pomegranate vinegar. Thanks for sharing. The korean stuff is delicious but I will soon be guzzling Waldburg too. To me it acts like a very powerful aphrodisiac. Seriously atomic! Hi Oztinato. If you want to sip pomegranate vinegar straight, then try VOM FASS WALDBURG Balsam Pomegranate. It has been aged and it doesn't taste so acidic, but it is expensive. Is it ok to sip a little pom vinegar straight? I love the stuff. Are you referring to Pompeian Red Wine Pomegranate Vinegar? I am not familiar with this brand, but I believed it is infused with the goodness of pomegranate. Vinegar that are made through the direct fermentation process using 100% pomegranate fruit will be the best, instead of the infused version. I am currently using the brand from Korean (see photo above). Not sure if you can buy this at Korean stores in your country. Sometimes I use the pomegranate vinegar imported from Turkey, which might be available in the Middle Eastern stores in your country. Whichever brands that are available nearest to your place, buy the 100% pomegranate vinegar and not the infused or mixed with other vinegar/fruits versions. Is there a particular brand of Pomegranate Vinegar? I found Pompeii Red Wine Pomegranate Vinegar at my local grocery store. Is this brand ok? Still full of the benefits? Or is there another brand I should buy? @nastarcia, For a start, take one teaspoon in a glass of water, once a day and slowly increase it to twice a day. Then, from one teaspoon, move up to one tablespoon. Hope you will gain from this. @Casey White, thanks. Using pomegranate extract as part of the foot scrub regime is new to me. Thanks for sharing this info. I'm going to try pomegranate vinegar! thanks for sharing this wonderful hub! Very well done. My daughter uses Pomegranate extract, along with many other extracts, in her sugar foot scrubs that she concocts in her kitchen. We have all kinds of vinegar but pomegranate. I have to get this one. Very informative hub. Useful and Voted up! Hi teaches12345, nice of you to drop by again. If you can't find pomegranate vinegar at your local specialty store/ Middle Eastern store, go on-line. You will find them. I did not know that pomegranate vinegar existed as a remedy in stores. I will have to look into this as my husband needs to keep his arteries helthy. Thanks for sharing this valuable informaiton. Voted up. Hi rosika. Thank you and I'm glad to hear that you enjoyed the article. If you intend to do your own pomegranate vinegar, be extra careful with the crushed seeds. If it enters the juice, the whole process may get spoilt. Good Luck and do let us know of your progress..make a hub! Really loved the information and am pleased to know about its benefit...I will try making pomegranate vinegar and will let you know! Thx! voted up! Hi thumbi7, nice of you to drop by again. Thanks for the comment and thanks for sharing. Thanks Ariel. Hope you will join the HubPages community soon. Hi I enjoyed reading this article, good information. Hi travel_man1971, thanks for dropping by. Yes you should give it a try. The fresh fruits may not be on season or can be expensive, so I take the supplement and the vinegar. This is really great stuff. I've seen pomegranate at the local market. I would like to give it a try by following your tips. Thanks for sharing! @Alydar..thanks. Good to know that you will be making the pomegranate vinegar, be sure to take care in not getting the crushed seed into your filtered juice. 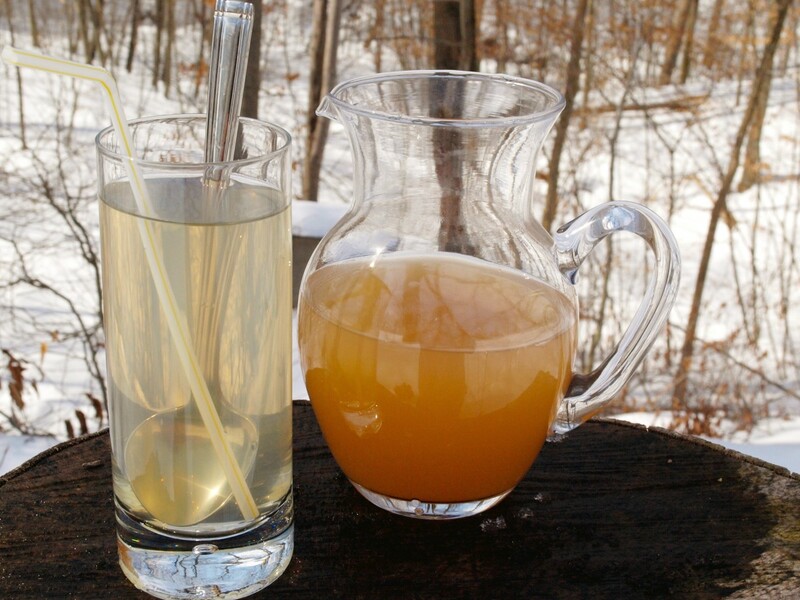 This is new to me...I can't wait to try making my own pommegranite vinegar;) Great hub!